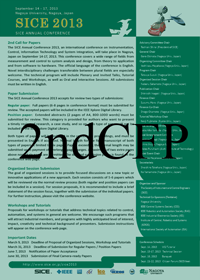 Different from past SICE annual conferences, SICE2013 introduces of two paper categories: Regular paper (reviewed by full paper) and Position paper (reviewed by extended abstract), for the first time. Both types of papers will be included in the conference proceedings, and must be presented in English if accepted. Note that the copyright of the final camera-ready version of both types of papers belongs to the Society of Instrument and Control Engineers (SICE) of Japan. Full papers (6-8 pages in conference format) must be submitted for review. Normal length for the final manuscript of the regular paper is six pages. Papers exceeding six pages may be submitted upon payment of overlength page charges. Extra charge for overlength pages is JPY10,000/page. A maximum of two extra pages above six pages are permitted. The accepted regular papers will be included in the IEEE Xplore Digital Library. This category is provided for authors who want to present a timely review of research, a case study, a survey, and so on. Extended abstracts (2 pages of A4, 800-1000 words) must be submitted for review. Normal length for the final manuscript of the position paper is two to six pages. Papers exceeding six pages may be submitted upon payment of overlength page charges. Extra charge for overlength pages is JPY10,000/page. A maximum of two extra pages above six pages are permitted. The position paper will not be included in the IEEE Xplore Digital Library. Regular & position papers must be submitted through the Papercept Conference Management System. Click on the button below for to submit your paper. The goal of organized sessions is to provide focused discussions on a new topic or innovative applications of a new approach. Each session consists of 5-6 papers which will be reviewed via the normal review process. In an organized session, both regular and position papers can be included. Prospective organizers should submit proposals that contain a statement describing the motivation and relevance of the proposed session as well as short descriptions (titles and authors) of component papers. Upon submission of a proposal, an identification code is issued and the component papers should be submitted under the corresponding code. Organized Session proposal must be submitted through the Papercept Conference Management System. Click on the button below for to submit your proposal.